The Tories say an independent inquiry into the UK's immigration system is needed following a series of claims of failings in the way it is run. 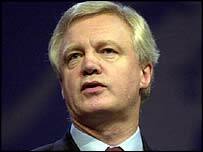 Shadow home secretary David Davis was speaking after Tony Blair's emergency Downing Street summit on the issue. Mr Davis said an inquiry into asylum statistics announced by Mr Blair would not be able to investigate ministerial actions or policy. "The system is not working...it's a complete shambles," he told the BBC. Home Secretary David Blunkett, who attended Tuesday's summit, said "the world is going a little bit mad", as he tried to draw a line under the immigration issue. Is the Australian system better? Following the top level hour-and-a-half of key Cabinet ministers and security staff, Mr Blair unveiled a National Audit Office (NAO) probe into asylum statistics to restore public faith. Mr Blunkett announced fresh crackdowns on bogus students and sham marriages. But Mr Davis said these were a "rehash" of failed former initiatives, describing the results of the summit as "frankly, fairly complacent". Mr Blunkett conceded there was nothing new in his pronouncements but insisted the event would produce results in the same way as a previous summit on street crime. "It supported me in turning the problem round," he said. However, Mr Davis told BBC Radio 4's Today programme he had asked for the NAO to look at asylum statistics a month ago. He said: "What they've got to have is the independent inquiry, otherwise we won't know what the extent of this problem is. "The system is not working - it's breaking down in a variety of different ways. It's a complete shambles in truth. "We don't know if it's the outcome of a policy intent or its simply poor management. "The effect of that is we don't actually know how many immigrants we have in the country, who they are, what their skills are." Mr Davis said: "The NAO cannot investigate ministerial actions, it can't investigate policy." He said bogus marriages were not the only problems, there were also bogus companies and bogus colleges. "We know from internal documents that ministers have actually discouraged people from pursuing these issues." Mr Davis pointed to the system used in Australia where states were consulted about their skills shortages and how many people were needed. "That's a sensible, rational approach - nothing like we have over here." He also called on ministers to re-instate without disciplinary action the civil service whistleblowers who raised concerns about the system in the first place, and who had, he said, been proved right. Mark Oaten, the Lib Dems home affairs spokesman, said bringing the NAO in to review asylum figures was "a sensible measure", but he was disappointed there would be no independent inquiry. Mr Blunkett said the government needed to restore "what was building trust" in the immigration system. He said he had been accused of causing the immigration problems by being too successful in cracking down on asylum. "I only bring attention to it because the world is going a little bit mad," he said. Mr Blunkett added that he agreed with the assessment made by Trevor Phillips, chairman of the Commission for Racial Equality, that the term "multiculturalism" is not useful. He believed "diversity with integration" was the way forward, adding: "There are parts of our country ... that are multicultural - that's not true of the rest of Britain." "Managed" immigration is essential for the economy, providing essential people and skills for the workforce. Abuses of the system need to be tackled in order to restore public confidence. The summit follows Mr Blair's promise to take a "close interest" in immigration issues after the resignation of Beverley Hughes last week. Ms Hughes quit as immigration minister after admitting she "unwittingly" misled people about a suspected visa scam involving applications from Romania and Bulgaria. "Downing Street sources say the Prime Minister will not allow this issue to rest"
"The stories are coming from front line immigration officers"